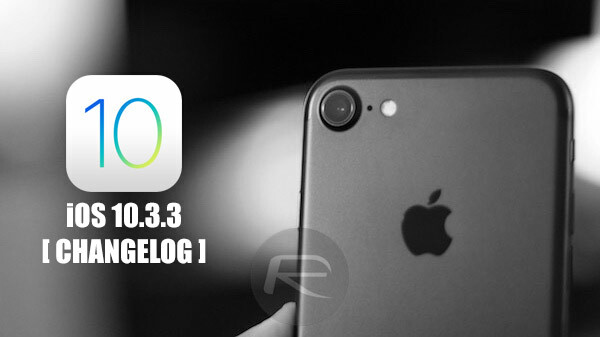 Here are iOS 10.3.3 release notes and changelog detailing all changes in one place after Apple flipped the switch on iOS 10.3.3 and made it available for download on all compatible iPhone, iPad, and iPod touch devices. This information gives you everything that you need to know about iOS 10.3.3, including any changes, improvements, or security patches. With final version of iOS 10.3.3 now available, anyone with a compatible iPhone, iPad, or iPod touch can instantly grab the latest version of iOS as an over-the-air update, or as a downloadable installation file which can be used in conjunction with iTunes to reinstall a fresh version of iOS. Having that ability to get the latest version of iOS also means that those same users can take advantage of anything that has been introduced by Apple as part of this release. It was a little shock for users to see Apple introduce an iOS 10.3.3 beta so soon after the public release of iOS 10.3.2, but when these releases come, you just have to roll with the punches and ensure that the platform gets tested to its fullest extent in order to push out a reliable version of iOS to the general public. With iOS 10.3.3, there hasn’t been a lot of new changes and improvements to test, save for a few small and notable improvements that may not offer outward-facing changes to device owners, but looks to bring a more stable platform to those who own a compatible piece of hardware. iPad Pro owners are most likely to benefit from the release of iOS 10.3.3. Not only do owners of Apple’s Pro tablet range get all of the fixes, improvements, and patches which come associated with iOS 10.3.3, but there is also the fact that it also ships with a number of new and beautiful wallpapers which are designed to perfectly compliment the large display of iPad Pro devices. No real consolidation to those who don’t own an iPad Pro, but there’s still the hugely important improvements made for everyone else. Check out the full official changelog, along with security changes, above to see exactly what has changed with this release.